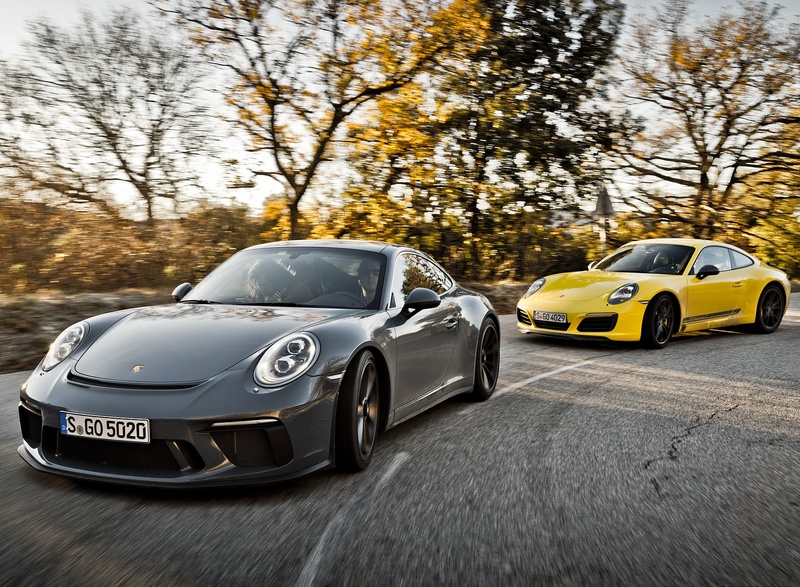 The 911 GT3 with Touring Package will be unveiled at the 67th International Motor Show (IAA), which will take place from September 12 to 24, 2017, in Frankfurt. 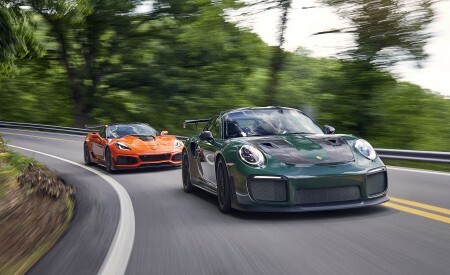 Instead of the fixed rear wing, when equipped with the optional Touring Package, the GT3 will have an adaptive rear spoiler similar to that of the 911 Carrera models. 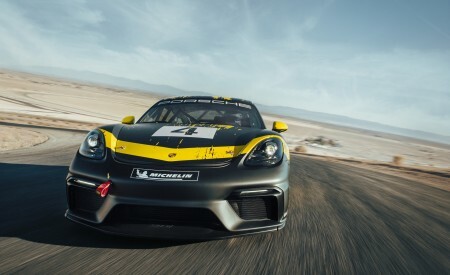 Beneath its understated exterior is pure motorsport-derived technology: The four-liter naturally aspirated flat-six engine develops 500 horsepower and generates 339 lb.-ft. of torque. 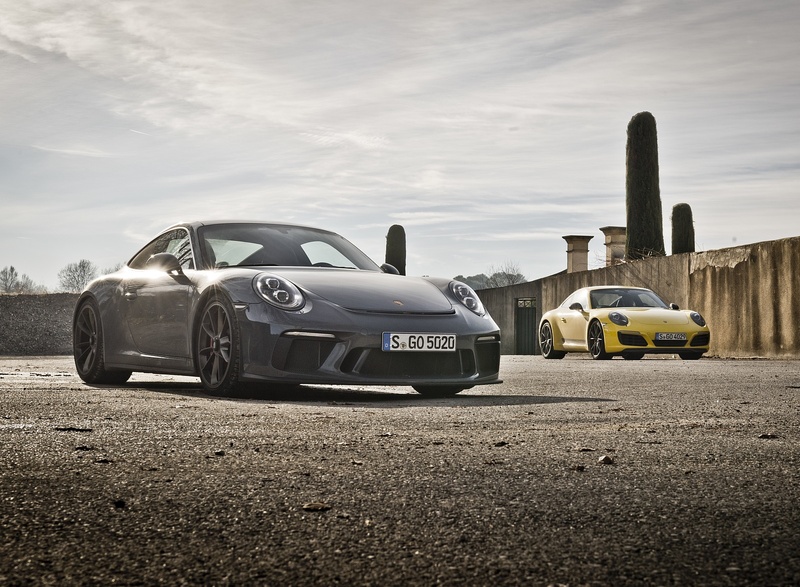 The 911 GT3 with Touring Package sprints from 0 to 60 miles per hour in 3.8 seconds and reaches a top track speed of 196 miles per hour. 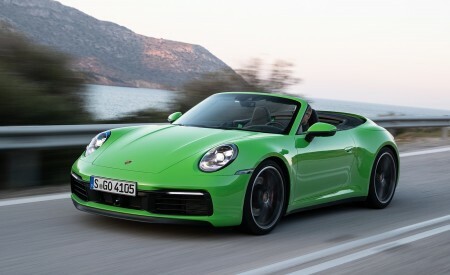 The Touring Package will be available exclusively in combination with the six-speed manual transmission. 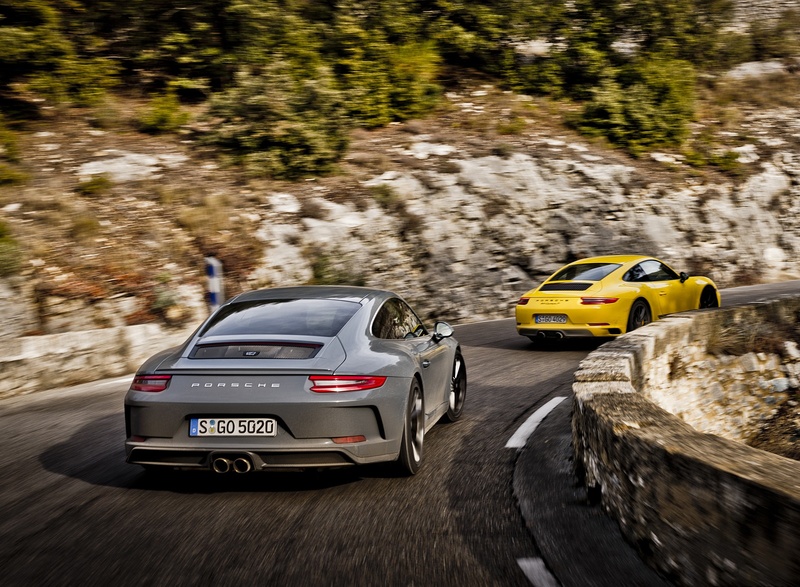 The name “Touring Package” harkens back to a variant of the 911 Carrera RS from 1973. 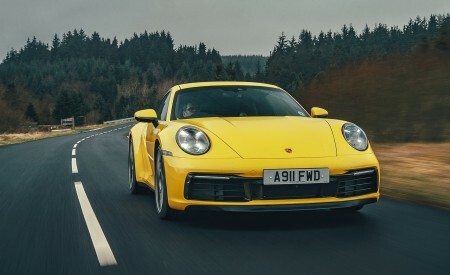 The very pure 911 design and classic interior features were key elements of this model. 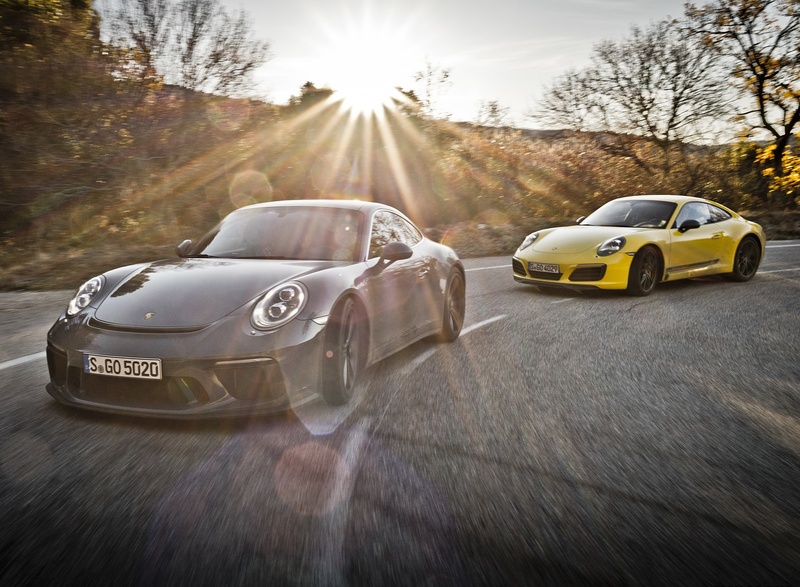 The new 911 GT3 when equipped with the Touring Package follows the same concept, and retains the two-seater arrangement of the 911 GT3. 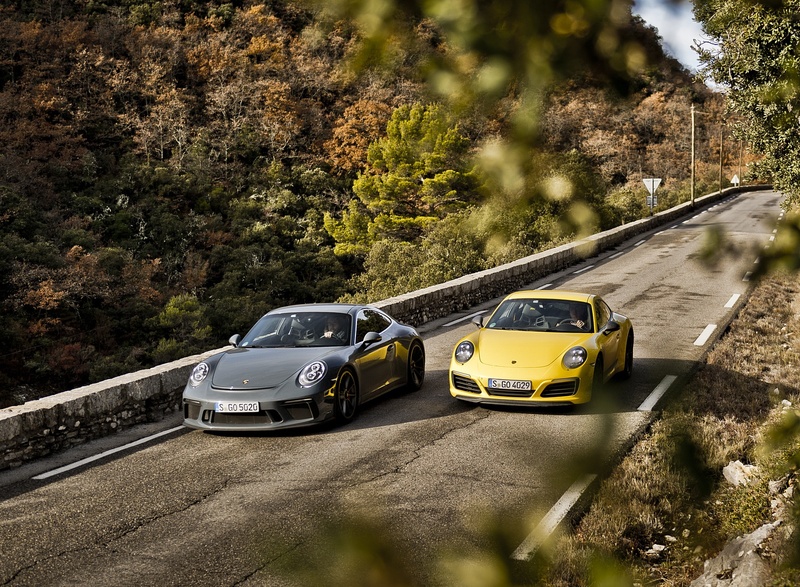 Apart from certain Alcantara®-covered interior fittings, almost all 911 GT3 options are also available in combination with the Touring Package. 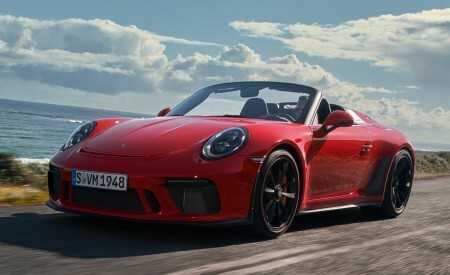 This includes all available exterior colors, wheel choices, the Porsche Ceramic Composite Brake (PCCB) system, the front axle lift system, LED headlights, three seat options, and the Sport Chrono Package. 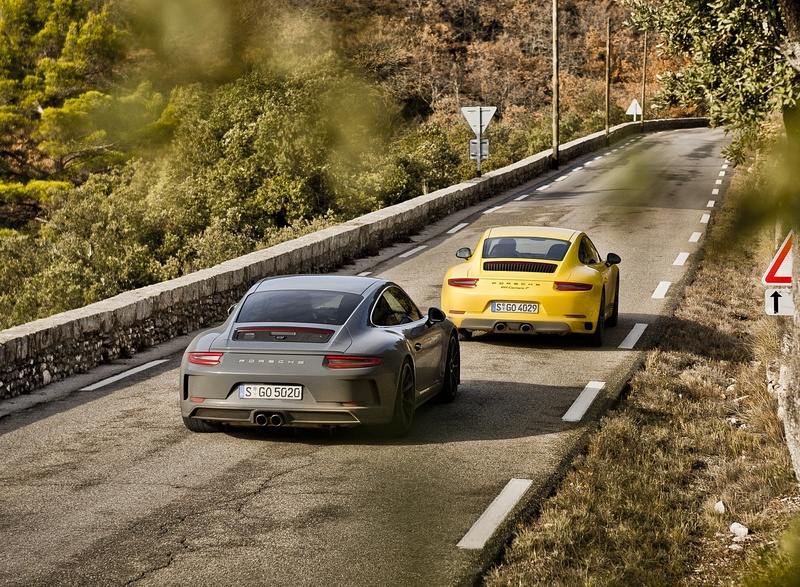 The subtle differences in the Porsche GT3 model when it is equipped with the Touring Package are primarily visible at the rear. 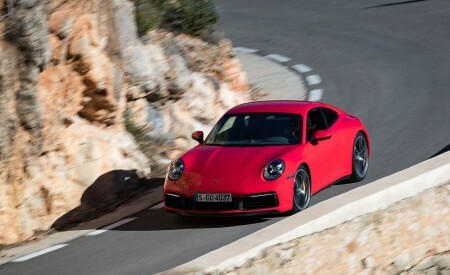 The automatically extending rear spoiler from the 911 Carrera models is equipped with an aerodynamic lip (“Gurney Flap”) finished in body color. 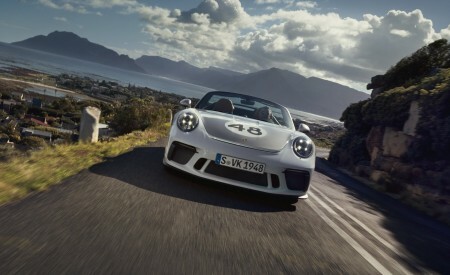 The specially designed rear decklid grille bears a new “GT3 touring” logo. 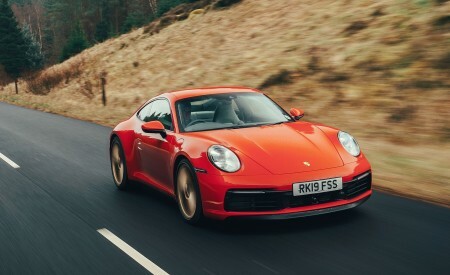 Other distinguishing features include side window surrounds, Sport Exhaust tailpipes, and headlight washer system covers which are finished in silver, as well as the Porsche logo at the rear. 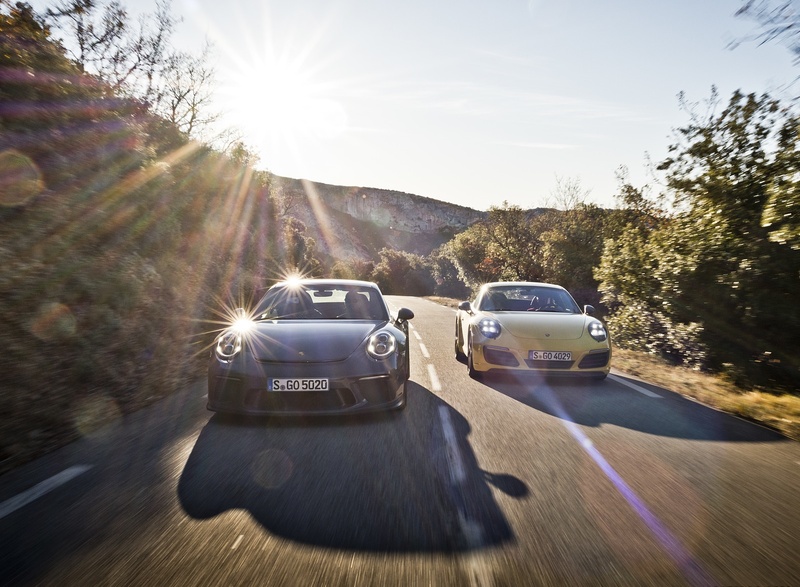 With the further available “Touring Package – Exterior in Black” option, these elements are finished in black, as on other 911 GT3 models. In this case, the front turn signal lenses and the taillights are tinted. 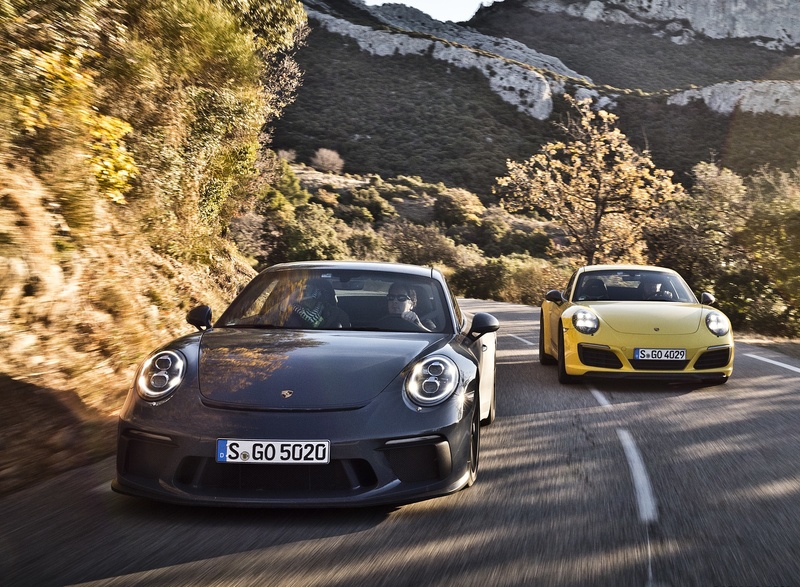 The interior creates the feel of a classic sports car with a manual transmission. 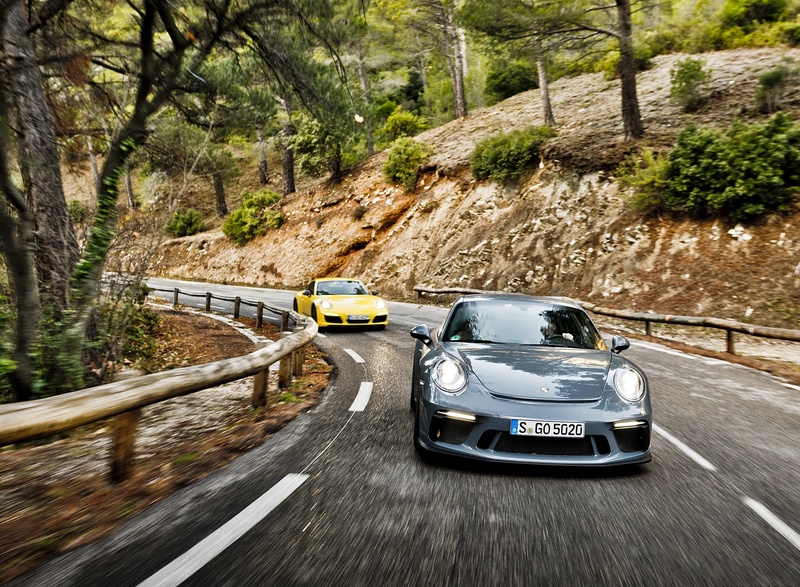 In line with the character of a GT car, leather is prevalent rather than Alcantara®, which is used in other GT3 models. The steering wheel rim with twelve o’clock marker, shift lever, door panel armrests, center console storage compartment lid and interior door handles are upholstered in smooth-finish leather. The seat centers are made of black fabric. The headrests feature embossed Porsche crests and all seams in the partial leather interior are sewn in black thread. The finishing touch to the interior is black brushed aluminum trim. 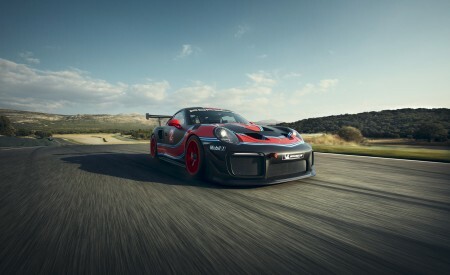 The gear ratios of the six gears are precisely tuned to the power delivery and torque curve of the engine and offer particularly sporty shifting characteristics. 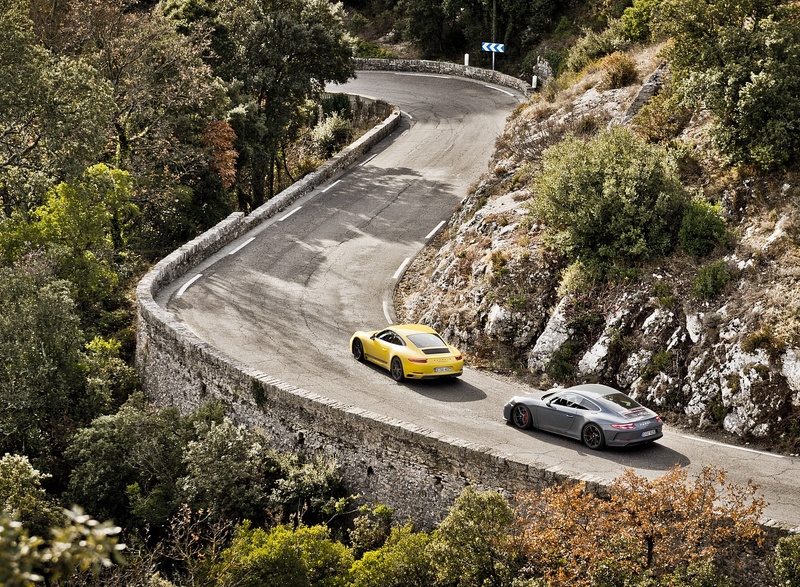 An automatic rev-match feature delivers an exciting sound on downshifts. 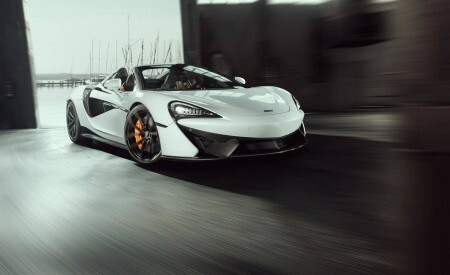 This function is activated via the “Sport” button on the center console, which enables a faster synchronization of the gears. 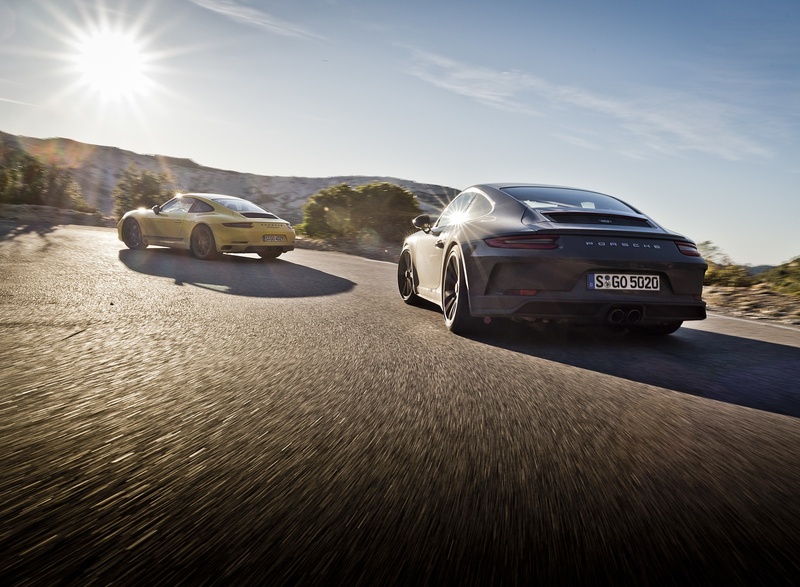 The GT Sport manual transmission transfers the power to a mechanical rear differential lock with brake-based torque vectoring (PTV). 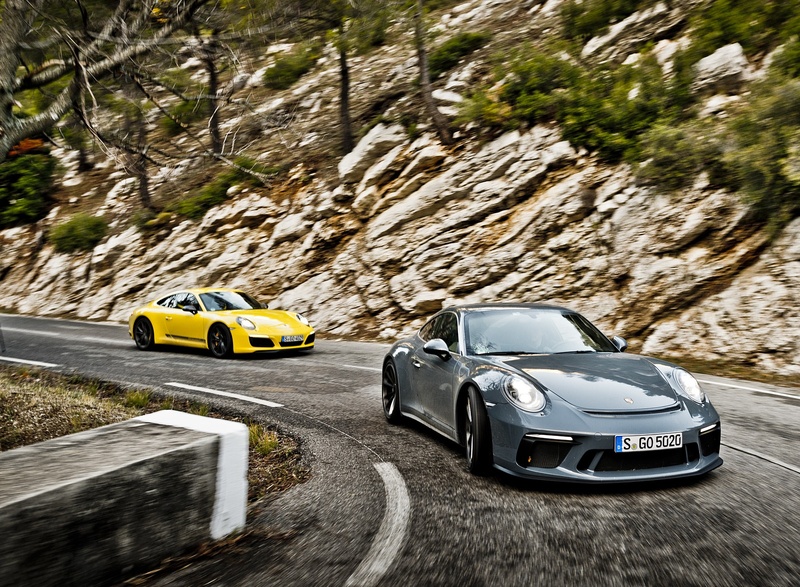 The chassis of the 911 GT3 is a testament to Porsche’s experience in motorsport. 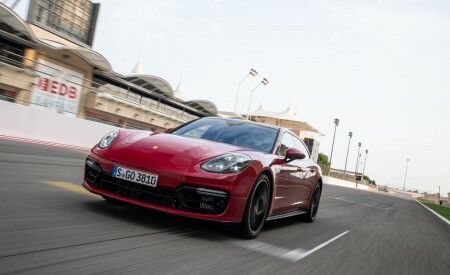 In addition to the basic layout, the chassis also boasts superior handling characteristics, thanks predominantly to the standard active rear-axle steering. 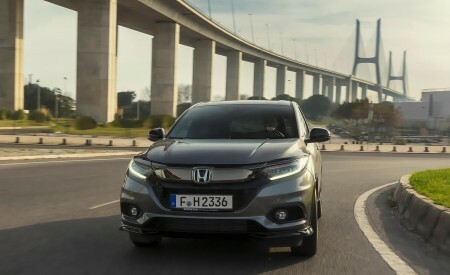 Depending upon the vehicle’s speed, it steers either in the opposite or the same direction as the front wheels, thereby improving the vehicle’s agility or stability. 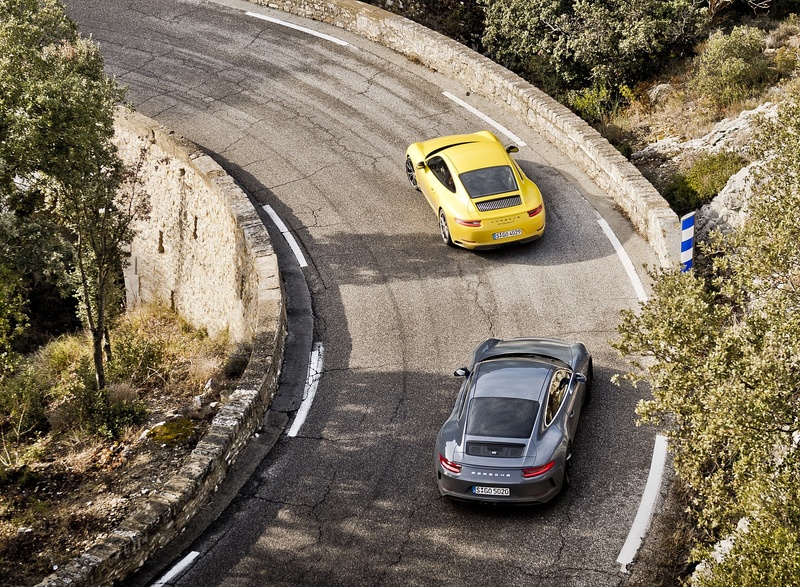 The size of the tires on both axles promote strong braking, sharp turn-in, and excellent traction.